Working with Adobe AfterEffects has been an extremely pleasant experience, especially in contrast to the challenges I faced when working with Gimp. What I enjoyed most about Adobe AfterEffects was its easy format. A lot of the program’s functions resemble those in Photoshop, making it a relatively easy transition. 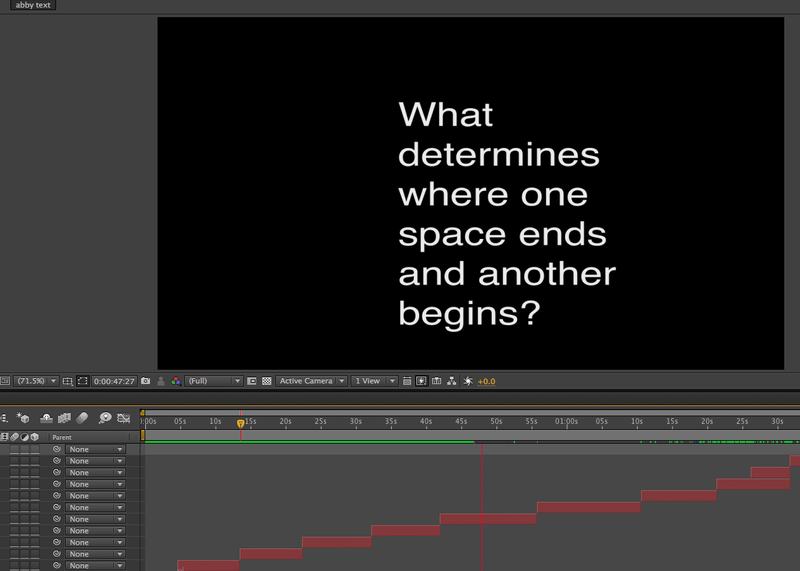 Despite this initial ease, AfterEffects challenged me by forcing me to test my patience when working with a new program. I caught myself trying to get through this project as soon as possible, rather than taking the time to enjoy the process and create high quality work. After realizing this, I made sure to go back over each piece of my AfterEffects project, to make sure that my initial impatience did not affect the quality of my work. 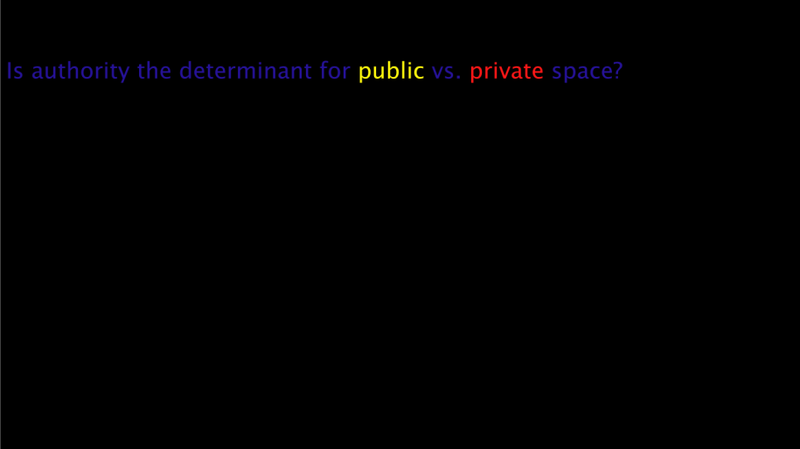 I focused the content of my work on the questions of space assignment we did via wordpress a few weeks ago. I liked the abstract questions that I proposed, and thought that it would be visually striking to have such open-ended questions rather than telling a story like in the “Dakota” video we watched in class. When it came to animating the text and bringing it to life, I tried to utilize AfterEffects’ functions to personify the meaning behind the words. 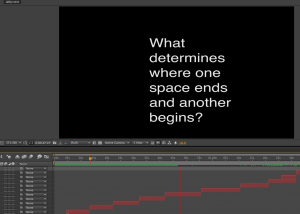 For example, I ask the question “What determines where one space ends and another begins?” I chose to animate this question by having the text stretch across the screen, suggesting that space is everywhere and there are no clear divisions between spaces. Furthermore, AfterEffects provided me with several opportunities to both learn about myself as a worker, and learn about utilizing a new computer program to create art. I am pleased with the developments I have made regarding both, in addition to the work I have created in class all semester.